본 연구는 학교폭력 피해경험이 청소년의 자살생각에 영향을 주는 과정에서 우울과 부모애착이 매개효과를 가지는지를 밝히는 것을 목적으로 한다. 이를 위해 중학생과 고등학생 768명을 대상으로 학교폭력 피해경험, 우울, 부모애착, 청소년의 자살생각을 측정하였고, SPSS 18.0과 AMOS 20.0을 사용하여 자료를 분석하였다. 연구결과를 요약하면 다음과 같다. 첫째, 학교폭력 피해경험이 청소년의 자살생각에 직접적인 영향을 주지는 않았으나, 우울을 완전 매개로 청소년의 자살생각에 영향을 주는 것으로 나타났다. 둘째, 학교폭력 피해경험이 청소년의 자살생각에 주는 영향에 부모애착은 직접적으로 매개하지는 않았으나, 학교폭력 피해경험이 부모애착을 부분 매개하여 우울에 영향을 주고 순차적으로 부모애착은 우울을 완전 매개하여 청소년의 자살생각에 영향을 주는 것으로 나타났다. 이러한 연구결과는 학교폭력의 피해를 경험한 청소년의 적응과 발달을 위한 이론적 함의와 청소년의 자살생각을 예방하기 위한 상담 및 심리 치료의 방향을 제시한다. The purpose of this study is to determine whether depression and parent attachment show mediating effect in the process that school-violence victimization experience influence adolescent`s suicidal ideation. To achieve this, a total of 768 middle and high school students responded to survey packet including measures of school-violence victimization experience, depression, parent attachment and suicidal ideation scales. The data was analyzed using SPSS 19.0 and AMOS 20.0. The results were as follows: First, school-violence victimization experience has no effect on adolescent`s suicidal ideation directly, and has effect on adolescent`s suicidal ideation through depression indirectly. 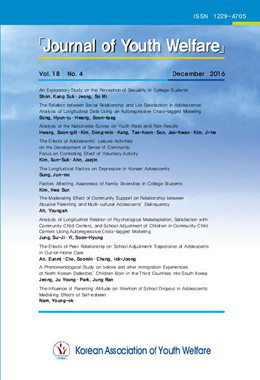 Second, school-violence victimization experience has effect on depression directly, and has effect on depression through parent attachment indirectly, in turn, parent attachment has no effect on adolescent`s suicidal ideation directly, and has effect on on adolescent`s suicidal ideation through depression indirectly. The findings of the study suggest theoretical implication for adaptation and growth of adolescent exposed to school-violence victimization experience, as well as the way of counseling and psychological treatment to prevent adolescent`s suicidal ideation.